After the rainy day yesterday, and a fairly rainy and cold start to today’s tennis, the one star to get a standing ovation today was the sun. It was a welcome sight after seeing players bundled up in towels for warmth, and spectators huddling under awnings to stay dry. At least Le Monde will have something to write about rather than the average rainfall at this time of year. Aga Radwanska and Bojana Javanovski didn’t play a long match, but what there was featured some of Aga’s trademark guile. Of all of the drop shots and lobs that wowed the crowd, the one I’ll remember most fondly touched the top of the net and literally rolled down the other side. Even Aga had to laugh. While winning his first ever title in Switzerland over the weekend certainly gave Stan Wawrinka confidence, it may have left him a bit too tired for his first round match against Lukas Rosol. Rosol struck early, going up two sets to one, and managed to keep Stan off balance with an array of shotmaking from the forehand and backhand sides. While Rosol showed the form that has made him a feared early round opponent, he became slightly less accurate over the long haul, and Wawrinka sealed the deal with a break at the beginning of the fifth set, and basked in the crowd’s cheers as he began his campaign to defend his title. What was at first a bit of rubbernecking at a patch of bad luck is becoming cause for concern. It’s not that Grigor Dimitrov lacks the skills or even the work ethic to win these matches, but he seems to lack the confidence in the big moments. Victor Troicki is a fine player, and one who was expected to win this match, based on the seeding, but Dimitrov’s loss here will sting. Maybe it’s time to give Brad Gilbert a call? Like Stan Wawrinka, Andy Murray will have to win a 5-setter to advance in the tournament, but he will have to finish tomorrow, as play was suspended due to darkness, with Murray down two sets to one, but up 4-2 in the fourth against Radek Stepanek. 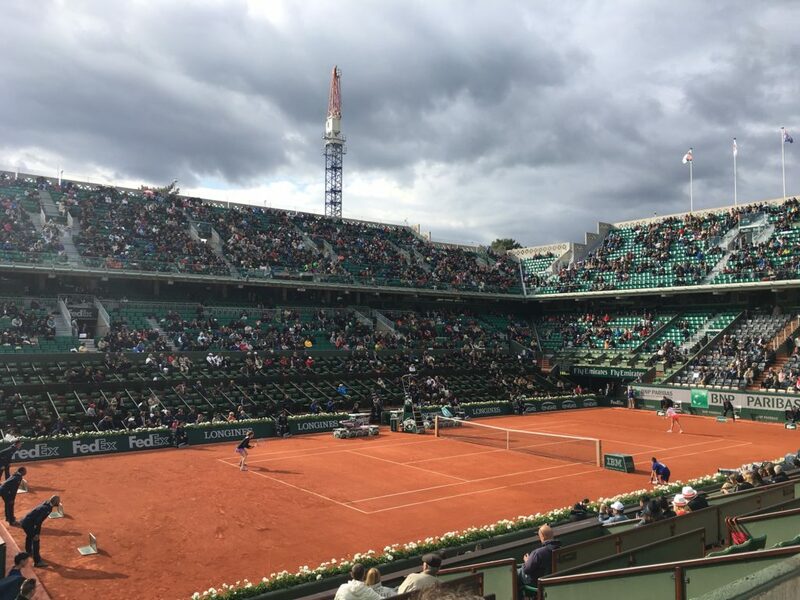 While Murray looked strong in Rome, he can’t expect to get past a determined Novak Djokovic here in Paris if he spends too much time on the court in Week 1, so his job tomorrow will be to close it out quickly. Admittedly, I watched much of this match over a fence from an adjacent court, but Veronica Cepede Royg’s easy win over Sabine Lisicki is a real head scratcher on paper, but between some lackluster serving from the German, and Royg’s poise and consistent groundstrokes, it was a quick loss for Lisicki, who has not had much success at Roland Garros over the years. A shocker, but Royg earned her way through! 7. Bonne Anniversaire, Suzanne Lenglen!